While it is true that most people relate marketing to economic purposes, these examples of NGO campaigns will show you how your perception can change. You must understand certain concepts clearly. For example, you need to understand as soon as possible that there are different types of advertising and not all those types seek profit. Some campaigns are aimed at gaining visibility, notoriety, generating engagement on social networks or simply causing a considerable impact on the audience to push them to act. Would you be able to detect the key element helping many of these examples of NGO marketing campaigns to have an impact? They are the visual elements, although the simple fact of being social marketing campaigns makes the content be perceived in a different way. Additionally, one of the resources that it is used a lot when creating social marketing campaigns is appealing to emotions. Especially because once you move your audience, their brain will process your content in a different way. But is it always easy to carry out this kind of campaigns? It is relatively simple for those who know how to find the perfect insight and manage to shape the campaign. However, many examples of NGO campaigns that you might be able to find have something in common. Many of them suffer from a lack of knowledge and resources to help them position themselves within the digital market, especially if it is a non-profit entity of small size. SEO and SEM strategies, usability and UX issues, social media, implementation of channels such as email marketing or SMS, etc. A good campaign knows how to include all these areas. However, it is a mistake to believe that only companies with great resources can create a good digital presence. You must keep in mind that it is not necessary for you to use each and every digital platform you can find. Nor should you be present in all existing social networks. You can use one or several channels and gain visibility, capture leads or build loyalty. For example, take a look at the two Charity:water landings that you can find at the beginning of the post. They will help you understand how you can achieve good results without the need for impressive campaigns. The first website stands out for its design’s simplicity, and also because of its adaptation to the latest trends. The visual contents are the correct ones, and it uses large images and videos. That is, it seeks to create an experience to appeal to emotions more easily. On the other hand, the copies are short and clear. At a first glance, any user can understand that the problem the organization is trying to solve is the access to water. 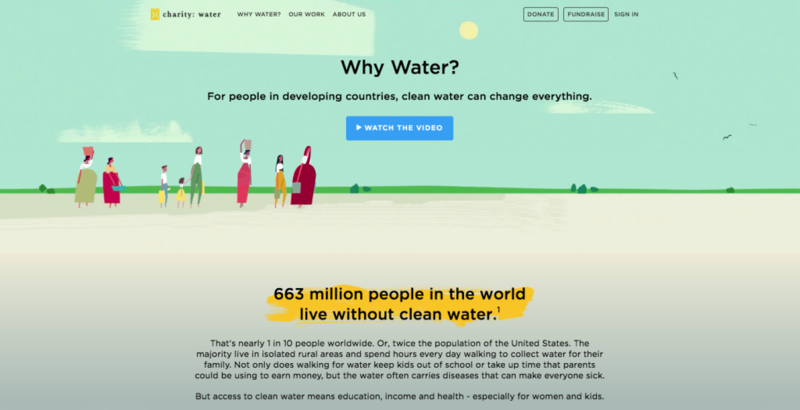 Once the user reaches the “Why water” section, he finds a more than convincing justification that explains the work of the organization. Would you like to know more campaigns? Do you know what other element is essential in the best examples of NGO campaigns? You should consider it as soon as possible, because it is what hooks the audience. It is storytelling. Many of the campaigns that you will learn about today have been able to present stories that are really captivating, such as this one from Fundación Arrels. If you watch the video, it is easy to understand the subject. The whole short film is aimed at reminding you that there are still many homeless people and at stressing the need of all persons to be taken into account. The organization uses typography as a resource. That is, each human being has a unique and personal font. This concept is used to raise funds in an original way. The plot revolves around the protagonists’ stories. They talk about what their life is like now, without mentioning the past. They tell us how they feel and how they live on the streets. In this case, the common thread is the reintegration project based on the creation and sale of fonts. Anyone can download an app to have access to all those fonts and thus, be able to customize all their channels. Injustice, the environment, gender violence, poverty, the job market. Social marketing refers to some of these issues. The objective is often to raise awareness on some issues. It is usually difficult to do so with just one message, although you will understand this one for sure. This campaign reflects the unemployment situation we are currently undergoing by means of two profiles, Adrián and Vanesa. They tell us how they have dealt with this situation. Together, they have created a help center where they share food and held debates to find solutions to the current situation. When you watch the campaign, you will find the protagonists’ testimonials telling you how their life changed once they became unemployed. In this case, empathy is the feeling that helps the viewer to better understand the story and the cause. This is one example of NGO campaigns that managed to boost the cause. In fact, thanks to this campaign, the Khanimambo Foundation managed to increase its number of benefactors by 10%. Even if your story does not have an introduction, problem and ending, this short story captures the reality of the children of Mozambique. For them, gifts are intangible things. That is why it compares them with the things that will make a first world’s child happy. While today’s children would love to have a smartphone, these children enjoy creating their own version of a cell phone using a cardboard. This is another example of the best NGO campaigns, which won the 2014 Cannes Lions International Festival of Creativity. The essence of this campaign aims at transmitting its message of awareness through the story of a 4-year-old child. From what you can see from the first moment, it tries to appeal to emotions by using feelings such as tenderness. The video shows the adventures of Nkaitole, a 4-year-old Masai child who represents a very small percentage of children with the potential of developing their abilities and surviving. The message transmits a not so common reality. That is why it encourages the audience to help children fulfill their dreams and to have a better life. You may believe that carrying out this kind of campaign is something too big for you, but you should know that not all NGOs are capable of creating a short video of these characteristics. But with a good story, it is possible for you to convey great things. How to make a message reach a child even when he is accompanied by his attacker? By means of a double viewer were the image shown changes, this campaign has managed to raise awareness among children about child abuse. Best of all, the real message can only be seen by children. Although videos are one of the most powerful formats to raise awareness and they are the most used channel in most examples of NGO campaigns, there are also other channels capable of creating an impact. 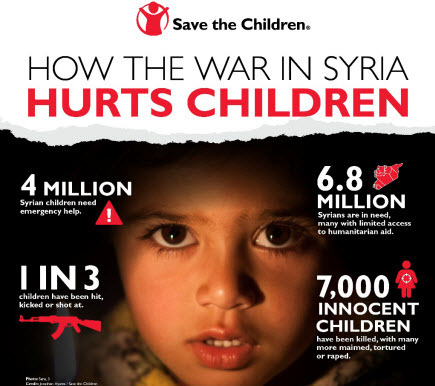 This is the case of Save the Children and email marketing, a campaign through which nobody remained indifferent. The organization shares a newsletter informing its contacts that the annual report is already available. As you can see, the image is the prominent element on the email. It is very well chosen, as children make us feel certain tenderness that makes the message stay longer in the memory and to reach people better. Additionally, the communication action is used to encourage the user to make a donation. The Swiss NGO Pro Infirmis works to help people with disabilities and their environment. Most of the examples of Pro Infirmis campaigns are famous in Switzerland, but it is possible to access them online too. In particular, this campaign works to raise awareness on the inclusion into society of people with certain disabilities, and it will also teach you how society reacts to this issue. Always appeal to emotions. With storytelling, videos, interactive images, music, virtual reality and different elements, you can get your message across in an optimal way. If possible, try to collaborate with an influencer in order to gain visibility. Making this kind of campaigns viral is essential to reach a more concrete and wider public. Seeks to empathize with citizens to get them involved in the cause. Include other communication channels in a complementary manner. Always use a positive and constructive approach. Do not lose sight of social networks. Are you looking to work with a marketing partner who understands your objectives and has the skills and technology to reach them? At Antevenio, we can help you carry out your Performance Marketing strategy.